Why a last-ditch effort to redeem the couples’ name fails so completely. 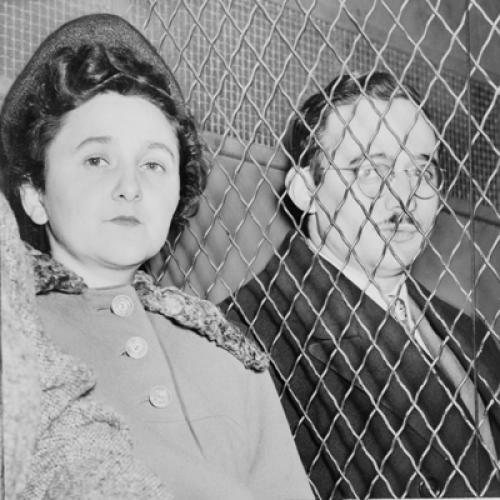 In March of 1951, a young Jewish couple from New York City, Ethel and Julius Rosenberg, both secret members of the American Communist Party, were tried in Federal Court for “conspiracy to commit espionage.” The Rosenbergs were accused of having passed secrets pertaining to the atomic bomb from Ethel’s brother, David Greenglass, who worked in a lab at Los Alamos, to the Soviets. In June of 1953, all legal appeals having been exhausted, the Rosenbergs were executed, becoming the only American civilians executed for espionage by the United States government. Their sentence shocked the world and was immediately seized by communists as a powerful tool in the propaganda war between the United States and the USSR. As time passed, the Rosenbergs’ defenders convinced many that the couple had been framed. The innocence of the Rosenbergs became a touchstone of the left; attempts to discuss evidence suggesting their guilt were assailed as appeasement of McCarthyism. Walter and Miriam Schneir’s Invitation to an Inquest (1965) was the textbook for this cause, providing a compelling narrative that, to many, proved that the Rosenbergs were innocent. This strain of thought continues in the latest Schneir book, Final Verdict, a posthumous work published earlier this year. Invitation to an Inquest distorted the historical record to make the case that the Rosenbergs were innocent of any association with Soviet espionage. The book argued that Harry Gold, the courier who received a sketch of part of the atomic bomb from David Greenglass never actually met Greenglass and never traveled to Albequerque in June 1945 for the supposed exchange. The authors’ major “proof” that Gold lied about the meeting was that the Hilton Hotel card offered at the trial by the defense was an FBI forgery, meant to falsely prove Gold was in Albuquerque. The Schneirs’ claims were challenged by the publication of The Rosenberg File, published in 1983. This book, written in part by one of the co-authors of this piece, argued that, despite clear judicial and legal improprieties in the Rosenbergs’ trial, Julius Rosenberg was indeed a Soviet agent who set up and ran a major espionage network for Stalin. Although Rosenberg defenders attacked the book, its findings were vindicated with the release in 1995 of previously classified cables from Moscow to KGB agents in America. These cables convinced even the most skeptical holdouts that the Rosenbergs had indeed been Soviet agents. Earlier this year, Mellville House published Final Verdict by the late Walter Schneir, with a foreword by his wife Miriam. In Final Verdict, Schneir accepts Julius’s guilt but argues that the real culprit was Ethel’s brother, David Greenglass, who, on his own, was an enthusiastic Soviet spy. The Schneirs’ revisionist theory asserts that the government gave Greenglass a break for cooperating with the government in their prosecution of the Rosenbergs. Writing recently in The Nation, the magazine’s former editor and publisher, Victor Navasky, proclaimed that Final Verdict presented a new view of the Rosenberg case. In making this argument, Navasky shows he has learned little since 1983, when he attacked The Rosenberg File and defended the Schneirs’ Invitation to an Inquest. Now, so many years later, when the intellectual community largely acknowledges the Rosenbergs’ guilt—a 2008 public confession by former Soviet spy Morton Sobell, who was tried along with the Rosenbergs, made continued denial impossible—Navasky has written what is possibly the last-ditch attempt to redeem the Rosenbergs. In Walter Schneir’s new book, he admits that he and his wife were wrong in Invitation and that Gold was telling the truth. Yet his intent is still to fudge the record in order to exonerate the Rosenbergs. Navasky, too, in his review of the book, has chosen to ignore decades of scholarship documenting Julius and Ethel Rosenberg's espionage activities. In contrast to a number of extensively researched, lengthy books on the Rosenbergs, Final Verdict weighs in at 154 pages and has a whopping 21 footnotes. Yet Navasky wants Nation readers to believe that this book proves that David Greenglass acted alone. This, by the way, is a reversal of the Schneirs' earlier insistence in Invitation that Greenglass had never been a spy. Anything to excuse the Rosenbergs. Most important of all, Navasky—like Walter Schneir in his new book—ignores the fact that Julius and Ethel recruited Greenglass after learning that he was stationed at the Manhattan Project. So, even if it was Greenglass who did the only real spying, he did so because Julius brought him into his already-existing network of spies. Navasky also ignores the fact that Julius Rosenberg recruited another major atomic spy, the previously unknown Russell McNutt, a revelation that appeared in the 2009 book Spies: The Rise and Fall of the KGB in America. Navasky and the Schneirs may not believe that this proves that Julius was an atomic spy, but the KGB did. A May 26, 1944 letter from the KGB, discussed in Spies, indicated that Rosenberg had been given a bonus for his “initiative in acquiring an agent [McNutt] to cultivate ‘Enormous,’ ” the KGB code name for the Manhattan Project. McNutt's employment provided access to secrets about processes for manufacturing weapons-grade uranium. Navasky concludes with a plea for the release of more documents about the Rosenberg case. In fact, more documents have been released about the Rosenbergs than about any other espionage operation in history, and each release brings to light facts that make it ever more impossible to deny that Julius Rosenberg was an important Soviet spy. The documents—tens of thousands of pages of FBI files, the decrypted classified cables from Moscow to KGB agents in America in 1995, the KGB notebooks examined in Spies, declassified Czechoslovakian intelligence files, and the Rosenberg grand jury transcripts—are complemented by memoirs from and interviews with members of the Rosenberg espionage ring. This mass of documentation shows that Julius Rosenberg began his espionage career before the German invasion of the Soviet Union (a time when Hitler and Stalin were allies) and that he continued for years after the end of World War II, when the Soviet Union's only potential opponent was the United States. This evidence also reveals that Julius was a more active atomic spy than the FBI, prosecutors, or his most ardent opponents ever suspected. The risks and sacrifices he took for the USSR surprised even hardened KGB officers. During a two-year period, from 1946 to 1948, when security concerns had caused the KGB to cut off communication, Rosenberg kept his ring together, stockpiled classified information in the hope that the KGB would get back in touch, and provided financial support to his agents. As for Ethel Rosenberg’s role, the evidence is unequivocal. She recruited her brother as an atomic spy and provided logistical support to Julius's espionage activities. She knew at least two Soviet intelligence officers, and they considered her a loyal and trustworthy compatriot. The most frequently cited exculpatory evidence, a decrypted transcript of a KGB cable stating that Ethel "does not work" could be, and most likely is, a reference to the fact that she did not have a job, rather than confirmation that she did not work for the KGB. She and Julius may not have deserved the death sentence, but she was not innocent. Finally, the truth that still escapes Navasky is that these Soviet spies were recruited out of the U.S. communist movement, whose leaders knew of and covered up the Rosenbergs’ espionage, and, when they found out that those arrested would not talk, waged a worldwide propaganda campaign to portray the Rosenbergs as victims of America’s imperial thrust. The Rosenbergs’ belief in the Soviet Union and communism was the motive for their actions. Julius began working for Soviet foreign intelligence during the time of the Nazi-Soviet Pact, when Stalin and Hitler were cooperating in the brutal division of Eastern Europe. Hence, the notion that Julius was simply working to oppose fascism is baseless. As in so many other episodes of this era, it was the anti-communists, and not the apologists for communism, whom history has proved correct. Ronald Radosh is co-author of The Rosenberg File, an Adjunct Fellow at the Hudson Institute, and a writer for Pajamas Media. Steven Usdin is author of Engineering Communism: How Two Americans Spied for Stalin and Founded the Soviet Silicon Valley. He is Senior Editor at BioCentury. Harvey Klehr, co-author of Spies: The Rise and Fall of the KGB in America, and is Andrew W. Mellon Professor of Politics and History, Emory University. John Earl Haynes, co-author of Spies: The Rise and Fall of the KGB in America. Mark Kramer, Director of The Cold War Studies Program at Harvard University and Harvard University Senior Fellow, The Davis Center for Russian and Eurasian Studies and editor of The Journal of Cold War History. Allen Hornblum, author of The Invisible Harry Gold: The Man Who Gave the Soviets the Atom Bomb.